One Palestinian was killed while 141 others, including 29 children, 12 women, a journalist and 5 paramedics, were wounded. One Palestinian was wounded in the West Bank. Israeli warplanes launched a missile at a group of peaceful protestors in the southern Gaza Strip; but no injuries were reported. Israeli forces conducted 65 incursions into Palestinian communities in the West Bank and 3 limited incursions were conducted in the Gaza Strip. 70 civilians, including 6 children, , were arrested in the West Bank. 11 of them, including 6 children, were arrested in Jerusalem. 4 glasshouse nurseries, a petrol station and a car wash were demolished in Hezmah village, while “container” was confiscated in Shu’fat . Mobile houses were established in the east of Abu Dese village to displacing the Bedouin Communities to them. A residential tent, 2 mobile houses used as classes and a tin plate roof were confiscated, south of Hebron. Settlers burn an uproot 766 trees, north and south of the West Bank. The participants, who were on board of a ship for Breaking Siege, were arrested by the Israeli gunboats. 2 Palestinian civilians were arrested at the internal military checkpoints in the West Bank. Israeli violations of international law and international humanitarian law in the oPt continued during the reporting period (05 – 11 July 2018). 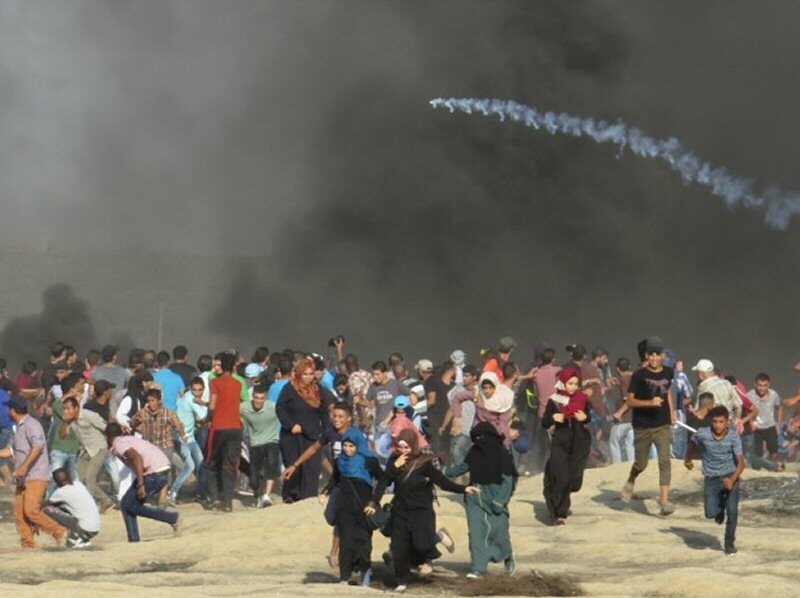 Israeli forces continued to use lethal force against Palestinian civilians, who participated in peaceful demonstrations organized within the activities of the “Great March of Return and Breaking the Siege” in the Gaza Strip, which witnessed for the 15th week in a row peaceful demonstrations along the eastern and northern Gaza Strip border area. During the reporting period in the Gaza Strip, the Israeli forces killed one Palestinian civilian. Moreover, the Israeli forces wounded 141 others, including 29 children, 12 women, a journalist and 5 paramedics. Seven of those wounded sustained serious wounds. In the West Bank, the Israeli forces wounded a Palestinian civilian in Nablus. In the Gaza Strip, on 06 July 2018, Israeli forces killed Mohamed Abu Halimah (22), from al-Shuja’iyah neighborhood, east of Gaza City, during his participation in the Great March of Return and Breaking Siege activities that were organized for the 15thconsecutive Friday. 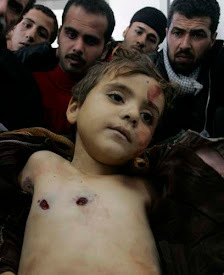 Mohammed was hit with a live bullet to the chest, resulting in killing him immediately. During the reporting period, while using the excessive force against the peaceful protesters along the Gaza Strip borders, the Israeli forces wounded 141 Palestinian civilians, including 29 children, 12 women, 5 paramedics and a journalist. Seven of those wounded sustained serious wounds. As part of targeting the border areas, on 05 July 2018, the Israeli forces stationed along the border fence between the Gaza Strip and Israel, opened fire at a motorbike, east of Deir al-Balah in the central Gaza Strip. As a result, the motorbike caught fire and was damaged, but no casualties were reported. On 08 July 2019, Israeli soldiers opened fire at a group of Palestinian young men, east of al-Buraij in the central Gaza Strip. The Israeli forces claimed that those young men flew incendiary kites. However, no casualties were reported. On 11 July 2018, Israeli soldiers stationed behind the border fence between the Gaza Strip and Israel opened fire at Palestinian shepherds, east of al-Shawkah village, east of Rafah, but no casualties were reported. As part of the airstrikes, on 11 July 2018, An Israeli warplane launched a missile at a group of civilian, who were participating in the Great March of Return, east of al-Shawkah village, east of Rafah. However, no casualties were reported. As part of targeting Palestinian fishermen in the Gaza Sea, the Israeli forces continued to escalate their attacks against the Palestinian fishermen, pointing out to the ongoing Israeli policy of targeting their livelihoods. During the reporting period, PCHR documented 5 shooting incidents at the fishermen, including 3 in the northern Gaza Strip and 2 in the southern Gaza Strip. In the West Bank, during the reporting period, the Israeli forces wounded a Palestinian civilian in Nablus. During the reporting period, Israeli forces conducted at least 65 military incursions into Palestinian communities in the West Bank and 5 similar ones into Jerusalem and its suburbs. During those incursions, Israeli forces arrested at least 59 Palestinians in the West Bank. Meanwhile, 11 other civilians, including 6 children, were arrested in Jerusalem and its suburbs. Among the arrestees was Wasfi ‘Ezzat Qabha (59), Minister of Prisoners’ Affairs in the 10th Palestinian Government, who was arrested from his house in Jenin on 05 July 2018. In the Gaza Strip, on 09 July 2018, the Israeli forces moved 100 meters into eastern al-Buraij in the central Gaza Strip. They levelled lands adjacent to the fence heading to the north to eastern al-Sheja’eyah neighbourhood, east of Gaza City, before redeploying along the border fence between the Gaza Strip and Israel. On 11 July 2018, the Israeli forces carried out 2 limited incursions in the southern and northern Gaza Strip. They leveled the lands and then redeployed along the border fence. As part of demolishing houses and civilian facilities, on 05 July 2018, the Israeli municipality vehicles demolished 4 glasshouses nurseries, a petrol station and a carwash in Hezmah village, northeast of East Jerusalem under the pretext of building without a license. These nurseries belonging to Malek al-Khatib, Mohammed ‘Afif, Hani ‘Asaker and Samer Sewari; the petrol station belonging to Ghaleb Salah Eden and the carwash belonging to Nader Salah Eden. The Israeli forces also leveled a 180-sqaure-meter land belonging to Nader Salah Eden. As part of its projects, which aim at expelling the Palestinian Bedouin from their Communities deployed in the eastern borders of occupied Jerusalem and gathering them in one area in favor of implementing their settlement projects in the area, the Israeli authorities set up caravans in Palestinian civilians’ lands, east of Abu Dis village, east of occupied Jerusalem, in order to displace the Bedouin residents to these caravans. Hani Halabiyia, the Spokesperson of the Popular Resistance Committees in Abu Dis village, said to PCHR’s fieldworker that the Israeli authorities set 23 mobile houses in the abovementioned area. On 11 July 2018, the Israeli vehicles the Israeli authorities confiscated a mobile house “container” in Shu’fat village, north of East Jerusalem under the pretext of building without a license. The container included decks for workers in al-Qawasmi Cars’ Showroom. On 05 July 2018, the Israeli forces confiscated a residential tent in Um Nir area near Susiya village, south of Yatta, south of Hebron. The tent, which was established about 3 weeks ago, was inhabited by Farid Jabour (37) and his family comprised of his wife and 3 children. After the Israeli forces confiscated the tent, Farid refused to leave the land, and have been staying along with his family under the trees since then. On the same day, Israeli forces dismantled pillars of a barrack built of tin plates in Kherbit al-Mofaqarah area, east of Yatta. The abovementioned barrack belongs to Qasem Mahmoud Hamamdah and was used for grazing sheep. It should be noted that It should be noted that the Israeli forces dismantled the tin plates 2 weeks ago and left the pillars in the area. On 11 July 2018, the Israeli forces confiscated 2 mobile houses in Khelat al-Dabe’a area, east of Yatta, south of Hebron. The 2 houses were built to accommodate 13 students from area, which lacks services. The mobile houses were brought from al-Hathalin area after a school of concrete was built there. On 05 July 2018, Israeli settlers from “Neve Daniel” settlement established in Palestinian civilians’ lands, south of Bethlehem, uprooted with an electric saw 350 grape trees from a plot of land belonging to Islam ‘Ali Jaber Ghunaim. The land’s owner said that while he was heading to his plot of land in Thaghrit Hammad area in al-Khadir village, which is located near the abovementioned settlement, he was surprised with uprooting the grape trees planted 5 years ago. in the same context, on 06 July 2018, a group of Israeli settlers from “Yitzhar” settlement established in “Orif” village’s lands, south of Nablus, attacked al-Marrah and al-Safafeer areas under the Israeli forces’ protection. The settlers set fire to trees and damaged their twigs. The number of trees, which were burnt and damaged, were 166, including 141 olive trees, 22 almond trees, and 3 grapevines. On 07 July 2018, a group of Israeli settler from “Neve Daniel” settlement established in Palestinian civilians’ lands, south of Bethlehem, uprooted with an electric saw 250 grape trees from a plot of land belonging to Hasan Isma’il ‘Esaa. Hasan said that he was waiting for several days to harvest the grape trees, which crops was estimated at 7 tons. As a result, Hasan’s family was deprived of the trees’ financial returns. At approximately 01:00, Israeli forces moved into Qalqiliyah. They raided and searched a house belonging to As’ad Amin al-Tawil (25) and then arrested him. At approximately 01:30, Israeli forces moved into Jenin. They then raided and searched a house belonging to engineer Wasfi ‘Ezzat Qabha (59), Minister of Prisoners’ Affairs in the 10th Palestinian Government, and then arrested him. It should be noted that the Israeli forces released Wasfi after arresting him on 07 February 2018, after he served 8 months of administrative detention. Wasfi has spent 14 years in total in the Israeli jails. Around the same time, Israeli forces moved into al-Thaheriyah village, south of Hebron and stationed in Karm al-Ashqar, al-Deir and al-Shaqan neighborhoods. They raided and searched several houses belonging to Khalid Ayman al-Batat, Ahmed ‘Ezzat Waridat, Mohammed Ismail al-Tal, Yusuf Suweilem al-Tal and Mohammed Ismail al-Tal (25), Member in the Palestinian Legislative Council (PLC) of the Reform and Change Bloc, and the arrested Khalid al-Battat. At approximately 03:00, Israeli forces moved into Ematin village, east of Qalqiliyah. They raided and searched a house belonging to Oseid Ahmed Bari (22) and then arrested him. At approximately 04:00, Israeli forces moved into al-Mazra’ah western village, northwest of Ramallah. They raided and searched a number of houses after which they arrested Nadim (21) and Yazan Mohammed Abu Rabi’a (25). At approximately 05:30, Israeli forces moved into al-Am’ari refugee camp, south of Ramallah. They raided and searched a house belonging to Mohammed Abdul Fattah Hamad (22) and then arrested him. Around the same time, Israeli forces moved into Senegal village, north of Ramallah. They raided and searched a house belonging to Husein Ibrahim Shabanah (23) and then arrested him. In the morning hours, Israeli forces moved into al-Khader village, south of Bethlehem. They raided and searched a number of houses during which they carried out a wide-scale arrest campaign using violence for more than 3 hours. Eyewitnesses said to PCHR’s fieldworker that around 50 soldiers accompanied with members of the Musta’ribeen Unit along with police dogs moved into the village and deployed in many neighborhoods, particularly the Old City and al-Balou’a area. The soldiers broke many doors of houses, including ‘Ouda ‘Essa’s house and damaged houses belonging to 5 brothers namely Ma’moun, Ziyad, Marwan Husein ‘Essa and brothers Husein and Mohammed ‘Ouda ‘Essa. At approximately 09:00, Israeli soldiers stationed behind the border fence between the Gaza Strip and Israel opened fire at a motorbike that was driving in the east of Deir al-Balah in the central Gaza Strip. As a result, the motorbike caught fire and was damaged, but no casualties were reported. Note: During the aforementioned day, Israeli forces conducted (10) incursions in the following areas and no arrests were reported: Nablus and ‘Asirah northern village, north of the city; Madama village, south of the city; Beit Led village, east of Tulkarm, Safarin village, southeast of the city; Kufor Qadoum village, northeast of Qalqiliyah; Dura, Abu al-‘Asja, Beit Ummer villages and al-‘Aroub refugee camp in Hebron. Note: During the aforementioned day, Israeli forces conducted (3) incursions in the following areas and no arrests were reported: al-Zawiyah village, northwest of Salfit; Hebron and al-‘Aroub refugee camp, north of the city. At approximately 11:00, Israeli gunboats stationed offshore, west of Khan Younis in the southern Gaza Strip, heavily opened fire at Palestinian fishing boats sailing within the allowed fishing area and chased them. at approximately 20:10, the shooting recurred at the fishing boats in the same area. As a result, the fishermen were forced to flee fearing for their lives, but no casualties nor material damage was reported. Note: During the aforementioned day, Israeli forces conducted (3) incursions in the following areas and no arrests were reported: ‘Azzoun village, east of Qalqiliyah; Deir Sharaf village, northwest of Nablus and Howarah village, south of the city. At approximately 01:45, Israeli forces moved into Rafat village, west of Salfit. They raided and searched a house belonging to Bilal Abdullah Abu ‘Osbah (33) and then arrested him. At approximately 02:30, Israeli forces moved into al-Thaheriyah village, south of Hebron and stationed in Abu Njaim area. They raided and searched a house belonging to Mohammed Na’el Abu Sharekh. They then withdrew from the village and no arrests were reported. At approximately 06:00, Israeli gunboats stationed off former al-Waha shore, northwest of Beit Lahia in the northern Gaza Strip, heavily opened fire at Palestinian fishing boats sailing within 3 nautical miles and chased them. As a result, the fishermen were forced to flee fearing for their lives, but neither casualties nor material damage was reported. At approximately 18:00, Israeli soldiers stationed behind the border fence between the Gaza Strip and Israel, opened fire at a group of young men who were east of al-Buraij in the central Gaza Strip. The Israeli forces claimed that those young men flew incendiary kites, but no casualties were reported. Note: During the aforementioned day, Israeli forces conducted (3) incursions in the following areas and no arrests were reported: Dura, Deir Samet and Shuyoukh al-‘Arab in Hebron. At approximately 01:00, Israeli forces moved into al-Mughir village, northeast of Ramallah. They raided and searched a house belonging to Tareq Ibrahim al-Haj (19) and then arrested him. At approximately 01:30, Israeli forces moved into al-Yamoun village, west of Jenin. They raided and searched a house belonging to Ghanem Bassam ‘Abahrah (29) and then arrested him. Around the same time, Israeli forces moved into Selah al-Harethiyah village, west of Jenin. They raided and searched a house belonging to Yusuf Ahmed ‘Ali Shawahnah (26) and then arrested him. Around the same time, Israeli forces moved into Halhoul, north of Hebron. They raided and searched a number of houses and then arrested civilians namely Yehyah ‘Essa ‘Ayash (24), Qais ‘Ali No’man (23) and Abdul Karim Mahmoud al-Qaisi (23). At approximately 02:00, Israeli forces moved into Namerah neighborhood in Hebron. They raided and searched a house belonging to Habib Mahmoud Qafishah (41) and then arrested him. At approximately 02:30, Israeli forces moved into Ya’bud village, southwest of Jenin. They raided and searched a house belonging to ‘Ali Abdul Rahman Ba’jawi (19_ and then arrested It should be noted that ‘Ali is studying at the Arab American University in Jenin. At approximately 03:30, Israeli forces moved into Nablus. They raided and searched a house belonging to ‘Ala’a Hamdan Abdul Karim Abu Khader (45) on ‘Asirah Street in the northern mount of the city and then arrested him. Around the same time, Israeli forces moved into al-Dahiyah neighborhood, southeast of Nablus. They raided and searched a house belonging to Jaber Je’an Duweikat (26) and then arrested him. At approximately 04:00, Israeli forces moved into Beta village, south of Nablus. They raided and searched a number of houses and then arrested 3 civilians namely Nehad Mamdouh Bani Shamsah (28), Ibrahim Mahmoud ‘Essa Dawoud (24) and laith Basem Dawoud (25). At approximately 04:30, Israeli forces moved into al-Jalazoun refugee camp, north of Ramallah. They raided and searched a number of houses and then arrested Talhah Mustafa Nakhlah (31). They then withdrew at approximately 06:00. It should be noted that Talhah was a former prisoner, who served 8 years in the Israeli jails. At approximately 07:30, Israeli forces accompanied with 4 bulldozers moved about 100 meters from the school gate, west of the border fence between the Gaza Strip and Israel, east of al-Buraij in the central Gaza Strip. They leveled lands in the area for more than an hour. Following that, the Israeli vehicles headed into the east of Gaza Valley and reached al-Shuja’iyah neighborhood, east of Gaza City and then redeployed behind the border fence. Note: During the aforementioned day, Israeli forces conducted (3) incursions in the following areas and no arrests were reported: Yatta, Sa’ir, Beit ‘Aninoun villages in Hebron. At approximately 01:00, Israeli forces moved into Jenin. They raided and searched a number of houses after which they arrested Mohammed Walid Jalamnah (31) and Ghassan ‘Adnan Mohammed al-Atrash (43). Around the same time, Israeli forces moved into Qabatiyah village, southeast of Jenin. They raided and searched a house belonging to Hesham Omer Zakarnah (23) and then arrested him. At approximately 01:55, Israeli forces moved into Qalqiliyah. They raided and searched a number of houses after which they arrested Baha’a Abdul Karim abu Hamed (25), Noor Eden Mohammed Ahmed Qasem Dawoud (32) and Naser Talal Baidah (25). At approximately 02:00, Israeli forces moved into Qarawet Bani Hassan village, northwest of Salfit. They raided and searched a house belonging to the family of Mohtaseb Mahmoud ‘Aasi (24) and then arrested him. Around the same time, Israeli forces moved into al-Thaheriyah village, south of Hebron and stationed in al-Deir area. They raided and searched a house belonging to Sharhabil Nassar Khalil Makharzah (44) and then arrested him. At approximately 02:30, Israeli forces moved into Sanour village, southeast of Jenin. They raided and searched several houses after which they arrested Laith Fou’ad Gharbiyah (23) and Tareq Ziyad Ghabiyah (25). At approximately 03:40, Israeli forces accompanied with 2 military vehicles moved into Silwad village, northeast of Ramallah. They raided and searched a number of houses belonging to Mohyee Yaheyah Hammad (24), Mohammed (18) and Jehad Zaher Hammad (20). At approximately 09:00, a group of Israeli undercover units “Mista’arvim” dressed like Palestinian civilians sneaked into al-Ja’afrah neighborhood in al-Duheishah refugee camp, south of Bethlehem using a civilian cars with Palestinian registration plates. They raided and searched a number of houses belonging to al-Atrash family amidst an excessive firing of sound bombs and tear gas canisters. They then arrested Hamdi Ma’rouf al-Atrash (27), his brother Mohammed (21) and Mohammed Yusuf al-Atrash (20). At approximately 13:30, Israeli forces moved into Kherbat al-Hadediyah in the northern Valleys, east of Tubas. They raided and searched several houses and then arrested Sakher Abdul Rahim Busharat (19). Note: During the aforementioned day, Israeli forces conducted (10) incursions in the following areas and no arrests were reported: al-Thaheriyah, Tarqumiyah, Abu al-‘Asja, Deir Razeh, al-‘Aroub refugee camp, ‘Atil, Baqah al-Sharqiyah, Nazlet ‘Essa, Nazlet Abu al-Nar and al-Nazlah al-Wusta, north of Tulkarm. At approximately 00:00, Israeli forces moved into Beit Fajjar village, south of Bethlehem. They raided and searched a number of houses and then arrested Jawad Mahmoud Taqatqah (23) and Shaher ‘Essa Taqatqah (25). At approximately 02:30, Israeli forces moved into Betunia village, southwest of Ramallah. They raided and searched a house belonging to Sobhi Abdul Rahman Abu Shushah (23) and then arrested him. At approximately 03:00, Israeli forces moved into Nablus and stationed in al-Ma’ajin neighborhood, northwest of the city. They raided and searched a house belonging to Ghassan Nayef Talab Thuqan (61), the Academic at An-Najah National University, in the 5th floor of building in the university housing. The soldiers confiscated aroun NIS 11,000 and $ 1,800 and 2 cell phones. They also attacked Ghassan and his sons Bara’a (20), Baha’a (23) and Mo’ath (32). Following that, the Israeli soldiers took Ghassan to al-Manahel Printing House that he owned at the entrance to Balatah refugee camp, east of the city. they searched the printing house and then confiscated the computer and then arrested Ghassan. The Israeli forces then moved into al-Namsawi neighborhood in the city. They raided and searched a house belonging to lawyer Ibrahim al-Tayeb nawaf al-‘Amer (29) and then arrested him. At approximately 03:30, Israeli forces moved into Qasrah village, east of Nablus. They raided and searched a house belonging to Yazan Mohammed Walid Abdul Qader al-Khalil (33) and then arrested him. At approximately 07:00, Israeli forces accompanied with 3 bulldozers and a tank moved about 100 meters into the west of the border fence between the Gaza Strip and Israel, adjacent to the Memorial Statute, southeast of Beit Hanoun in the northern Gaza Strip. They leveled and combed lands that were previously leveled amidst sporadically opening fire. At approximately 08:45, the Israeli forces redeployed behind the border fence, but neither casualties nor material damage was reported. At approximately 08:35, Israeli gunboats stationed off former al-Waha shore, northwest of Beit Lahia in the northern Gaza Strip, heavily opened fire at Palestinian fishing boats sailing within 3 nautical miles and chased them. As a result, the fishermen were forced to flee fearing for their lives, but neither casualties nor material damage was reported. At approximately 09:00, Israeli soldiers stationed behind the border fence between the Gaza Strip and Israel, opened fire at Palestinian shepherds, east of al-Shawkah village, east of Rafah in the southern Gaza Strip, but neither casualties nor material damage was reported. At approximately 08:00, Israeli forces accompanied with a number of military vehicles and bulldozers moved about 50 meters from the border fence between the Gaza Strip and Israel into al-Shawkah village, east of Rafah in the southern Gaza Strip. they leveled lands adjacent to the abovementioned border fence. At approximately 11:00, the Israeli forces redeployed behind the border fence. At approximately 17:00, Israeli forces stationed behind the border fence between the Gaza Strip and Israel, adjacent to the Return encampment, east of al-Shawkah village, east of Rafah, fired live bullets at 4 young men who approached the border fence. The soldiers crossed the border fence towards the Gaza Strip lands and were able to detain one of the young men while the 3 others were able to flee. At approximately 15:15, Israeli drones fired a missile at a group of civilians, who participated in the Great March of Return, east of al-Shawkah village, east of Rafah, but no casualties were reported. Note: During the aforementioned day, Israeli forces conducted (3) incursions in the following areas and no arrests were reported: Yatta, al-Thaheriyah and Beta villages, south of Nablus. At approximately 16:00 on Friday 06 July 2018, thousands of civilians swarmed to the Return encampments established by the Supreme National Authority for the Great March of Return and Breaking Siege, east of Malakah intersection, east of al-Zaytoun neighborhood, east of Gaza City in the 15th consecutive Friday. The activities included raising flags, chanting national slogans, setting fire to tires and flying kites. Though the demonstrations were fully peaceful, Israeli forces stationed behind the border fence between the Gaza Strip and Israel deliberately and randomly fired live and rubber bullets and tear gas canisters at them. As a result, Mohammed Jamal ‘Elyan Abu Halimah (22), from al-Shuja’iyah neighborhood, east of Gaza City, was hit with a live bullet to the chest, causing his immediate death. Moreover, 62 civilians, including 10 children and 9 women, were hit with live bullets and its shrapnel and tear gas canisters. Around the same time, hundreds of Palestinians swarmed to the Return encampments, east of Khuza’ah village, east of Khan Younis in the southern Gaza Strip to participate in the demonstrations organized by Supreme National Authority for the Great March of Return and Breaking Siege. The number of protestors increased at approximately 16:30, as the participants gathered inside the encampments yard and organized a memorial service for Yasser Amjad Abu Naja (12), who was killed by the Israeli forces on last Friday. Moreover, hundreds of civilians gathered outside the camp’s yard, raised flags, chanted national slogans and flew dozens of kites as dozens of them approached the border fence between the Gaza Strip and Israel and set fire. A number of them attempted to throw stones at Israeli forces and remove the barbed wire fence established by those forces on the Palestinian lands 30-50 meters away from the main border fence. The Israeli forces stationed behind hills, sand barriers, military vehicles and their vicinity sporadically opened fire and fired tear gas canisters at the protestors and at the area behind them. An Israeli drone also fired tear gas canisters amidst the protestors and near the area where the ambulances were stationed, 250 meters away from the border fence. The shooting continued until approximately 20:00. As a result, 27 civilians, including 4 children, 2 women and 2 paramedics, were hit with live bullets and tear gas canisters. The wounded civilians were taken to the field hospital and then transferred to Nasser, Gaza European and Algerian Hospitals in Khan Younis. At approximately 16:30 on the same day, thousands of civilians swarmed to the Return encampments established by the Supreme National Authority for the Great March of Return and Breaking Siege, 400 meters away from the border fence between the Gaza Strip and Israel, east of al-Buraij in the central Gaza Strip. Dozens of them approached the border fence, set fire to tires and threw stones at Israeli soldiers stationed behind the border fence. The soldiers fired live and rubber bullets and tear gas canisters at the participants. The clashes continued until the evening hours. As a result, 18 civilians, including 3 children, a paramedic and a journalist, were wounded. Twelve of them were hit with live bullets and its shrapnel and 6 were directly hit with tear gas canisters. The wounded civilians were transferred via PRCS ambulances to al-Aqsa Hospital in Deir al-Balah. Doctors classified the injury of 3 civilians as serious. One of them immediately entered the surgery room while the 2 others were transferred to al-Shifa Hospital in Gaza City. The other civilians’ injuries were classified between minor and moderate. The Israeli forces targeted the civilians’ gathering in camps and the field hospital belonging to the Ministry of Health. As a result, a number of medical staffers and dozens of civilians suffered tear gas inhalation. Some of them received medical treatment on the spot while others were taken to al-Aqsa Hospital in Deir al-Balah. At approximately 17:00, hundreds of Palestinian swarmed to the Return encampments established by the Supreme National Authority for the Great March of Return, east of Abu Safiyah Hill, northeast of Jabalia in the northern Gaza Strip. The protestors raised Palestinian flags, chanted national slogans and set fire to tires. Dozens of them approached the border fence between the Gaza Strip and Israel and threw stones at Israeli soldiers stationed behind the border fence. The Israeli forces deliberately and randomly fired live and rubber bullets and tear gas canisters at them. the clashes continued until approximately 20:30 on the same day. As a result, 23 civilians, including 8 children and a paramedic, were wounded. Seventeen of them were hit with live bullets and its shrapnel while 6 of them were hit with tear gas canisters. The wounded civilians were transferred via PRCS ambulances, Medical Services, General Union Committee and the Ministry of Health to the Indonesian and al-Awda Hospitals. Doctors classified the injury of 2 civilians as serious. The wounded paramedic was identified as Mahmoud Hasan Abu ‘Aitah (26), a volunteer at PRCS was hit with a tear gas canister to the left leg. Around the same time, on the same Friday, thousands of Palestinian protestors swarmed to the encampments established by the Supreme National Authority for the Great March of Return, 300 meters away from the border fence between the Gaza Strip and Israel, east of east of al-Shawkah village, east of Rafah in the southern Gaza Strip. A number of them approached the border fence, flew kites, set fire to tires and threw stones at Israeli soldiers stationed behind sand barriers along the border fence. The soldiers fired live bullets and tear gas canisters at them. The clashes continued until approximately 20:00. As a result, 11 civilians, including 4 children, a woman and a paramedic, were wounded. Five of them were hit with live bullets and its shrapnel and 6 others were directly hit with tear gas canisters. The wounded civilians were taken to the field hospital in the Return camp and then transferred to Abu Yusuf al-Najjar Hospital in Rafah. Doctors classified the injury of 2 civilians as serious. The wounded paramedic was identified as ‘Ali Mohammed al-‘Aloul (24). At approximately 11:00 on Saturday, 07 July 2018, dozens of Palestinian civilians, and Israeli and international human rights defenders organized a peaceful demonstration in al-Hamra area, east of Bani Na’im village, east of Hebron, demanding the Israeli forces to deport the settlers of the land belonging to D’ais family. The 20-dunum land, which is adjacent to “Bani Hefer” settlement, was overtaken by the Israeli settlers since a month and half. The protestors raised flags and chanted national slogans. An Israeli force immediately arrived at the area and the soldiers surrounded the protestors, prevented the media crews from covering the incidents and then announced the area as military closed zone. After verbal clashes, a number of the participants were arrested, including Eyad Abdul Hafeth al-Hashlamun (28), a photographer at Palestine TV Channel, and Bade’a Ismail al-Duwaik (45) and a number of foreign and Israel activists. The arrestees were transferred to an investigation center in “Kiryat Arba” settlement, east of Hebron. In the evening hours, the arrestees were released and the Israeli forces prevented them from returning to the area for 15 days while the foreigners were deported from the West Bank for 15 days. On Thursday, 05 July 2018, Israeli authorities allowed 2 persons; on Sunday, 08 July 2018, one person; and on Tuesday, 10 July 2018, 5 persons to return to the West Bank. On Sunday, 08 July 2018, Israeli authorities allowed 18 farmers to travel via the crossing to attend an agricultural training course. On Sunday, 08 July 2018, Israeli authorities allowed 6 athletes to travel via the crossing to attend a sport training course. On Tuesday, 10 July 2018, Israeli authorities allowed a person, who works at the General Authority of Civil Affairs (GACA) and internationals to renew their permits. At approximately 10:00 on Tuesday, 10 July 2018, the Supreme National Authority for the Great March of Return and Breaking Siege declared in a crowded festival established in Gaza Seaport, west of Gaza City, the kicking off ” Freedom and Breaking Siege Ship 2″ as part of the Great March of Return and Breaking Siege activities. This March was launched from the Gaza Strip on 30 March 2018 to challenge the Israeli closure imposed on the Gaza Strip and to facilitate the travelling of patients, university students and holders of residence visas in countries abroad. According to PCHR’s fieldworker’s observations of the activities of kicking off the ship, at approximately 11:30 on Tuesday, a ship, which was manned by 8 civilians, a ship, kicked off from Gaza Seaport to Cyprus. The persons, who were on the ship board, were identified as: Mahmoud Jehad Abu ‘Atayiah, Raied Khalil Diyab and Ayman Mohamed al-Louh ( all of them were wounded); ‘Aliyan Kamel al-Louh (hepatic patient); Mohamed Ibrahim al-‘Arow and ‘Ali Hisham Abu ‘Atayiah ( Both of them are students), and Khaled al-Hesi and his nephew Mohamed al-Hesi (ship’s captain). The Israeli gunboats stationed offshore began to approach the ship that was sailing within 6 nautical miles and intercepted its way when it was sailing within 12 nautical miles offshore. The connection with the participants on the shop was cut off and they were arrested and taken to Ashdod Seaport in Israel. At approximately 22:00, the Israeli forces released all the ship’s passengers, except the captain, Khaled Mohamed al-Hesi, via Beit Hanoun (Erez) Crossing, north of the Gaza Strip. On Saturday, 07 July 2018, Israeli forces established 4 checkpoints at the entrances to Dir Buzaigh, west of Ramllah; al-Nabi Saleh village, northwest of the city; Dir Jareer village, northeast of the city; and at the intersection of ‘Ain Sinah village, north of the city. Hebron: Israeli forces established (18) checkpoints all over the city. On Thursday, 05 July 2018, Israeli forces established 3 checkpoints at the entrances to Ethna and S’ir villages and on Wad al-Joud Road, west of Bani Na’iem village. On Friday, 06 July 2018, 3 similar checkpoints were established at the northern entrance to Hebron, at the entrance to al-Fawar refugee camp, and at the eastern entrance to Dura village. On Sunday, 08 July 2018, Israeli forces established 4 checkpoints at the entrance to al-‘Aroub refugee camp, at the southern entrance to Hebron, at the entrance to Bani N’’iem village, and on Wad Sa’ir Road. On Tuesday, 10 July 2018, Israeli forces established 4 checkpoints at the western entrance to Hebron, at the entrance to al-Fawar refugee camp, and at the entrances to Ethna and Beit Ummer villages. On Wednesday, 11 July 2018, 4 similar checkpoints were established at the western entrance to Dura, at the northern entrance to Halhoul village, at the entrance to Karmah village, and on Wad al-Shajinah Road. Qalqiliyah: Israeli forces established (14) checkpoints all over the city. On Thursday, 05 July 2018, Israeli forces established 5 checkpoints at the eastern entrance to Qalqiliyia ( was established 2 times), at the entrances to Jinasafout and ‘Azoun villages, and at the entrance to ‘Azbit Jal’oud villages, south of the city. At approximately 18:00 on Friday, 06 July 2018, Israeli forces established a checkpoint between al-Nabi Iyya and ‘Izbit al-Tabeeb villages, east of Qalqilyia. At approximately 18:10, a similar checkpoint was established between ‘Azoun and ‘Izbit al-Tabeeb villages, east of the city. At approximately 19:00 on Sunday, 08 July 2018, Israeli forces established a checkpoint at the entrance to ‘Azoun village, east of Qalqiliyia. On Monday, 09 July 2018, Israeli forces established 6 checkpoints at the eastern and southern entrance to Hablah tunnel of Qaliliyia; at the entrances to Jinasafout, ‘Izbit al-Tabeeb and ‘Azoun villages; and between Jayyous and ‘Azoun villages, east of the city. At approximately 17:00 on Friday, 06 July 2018, Israeli forces established a checkpoint on Qoblan-al-Sawiyia Road, south of Nablus. At approximately 10:30 on Saturday, 07 July 2018, Israeli forces established a checkpoint at the intersection of al-Naqourah and “Shavei Shomron“settlement on Nablus-Jenin Road. At approximately 17:15, the abovementioned checkpoint was established again. At approximately 14:00 on Friday, 06 July 2018, Israeli forces established a checkpoint at the northern entrance to Salfit. At approximately 16:50 on Sunday, Israeli forces established a checkpoint at the entrance to Beit Lid village, east of Tulkarm. At approximately 22:00 on Saturday, 07 July 2018, Israeli forces, who established a checkpoint near ‘Oyoun Haramiyah area on Nablus-Ramallah Road, confiscated a car for selling fruits belonging to Suleiman Ahmed Nabhan Saqer (25), from ‘Asker Camp, east of Nablus. Suleiman said to PCHR’s fieldworker that: “At approximately 16:30 on Saturday, 07 July 2018, my father and I were returning from Ramallah to Nablus. I was surprised with a checkpoint established near ‘Oyoun Haramiyah area, where a large number of vehicles were parking and Israeli soldiers were checking the passengers’ IDs. I was driving my car and carrying a fruit box. When I arrived at the checkpoint, the soldiers ordered us to show our IDs in order to check them. They then got my father out of the car and asked me to park the car and then step out of it. They then put each of us on different sides of the checkpoint. After an argument erupted between my father and the soldiers, then put us together and informed us that an officer will come and talk with us. At approximately 22:00 on the same day, an officer came and gave me a list of a confiscated item, claiming that the car was bought by terrorist funds. After that, we returned to our house by cars passing on the road. At approximately 16:00 on Thursday, 05 July 2018, Israeli forces stationed at Hawarah checkpoint, south of Nablus, arrested Islam Ameen al-Taweel (21), from Qalqiliyia. It should be noted that the Israeli forces also arrested Islam’s brother As’ad from his family house. At approximately 13:00 on Saturday, 07 July 2018, Israeli forces stationed at Beit Foreek checkpoint, east of Nablus, arrested Rabie’ Hashem Lubadah (25), from Beit Foreek. Eyewitnesses said that the Israeli forces stationed at the checkpoint stopped a vehicle carrying Rabie’ and took him, under the threat of weapon, into the checkpoint. He was then taken to an unknown destination. At approximately 18:30 on Thursday, 05 July 2018, Israeli forces moved into al-‘Issawiyia village, northeast of occupied East Jerusalem. They raided and searched a house belonging to Amjad Shafeeq ‘Obaid (24) and then arrested him. At approximately 22:00, Israeli forces moved into Bab al-Silsilah neighborhood in occupied East Jerusalem’s Old City. They raided and searched a house belonging to ‘Isaa Mohamed Mit’ib (19) and then arrested him. At approximately 18:00 on Saturday, 07 July 2018, Israeli forces raided a bakery belonging to Jawdat Sadeq Abu Isninah (47) in al-Sa’idiyia neighborhood in occupied East Jerusalem’s Old City. The Israeli forces then arrested Jawdat and his son Malek (20) after beating them up. Jawdat and his son Malek were then taken to an investigation center. At approximately 02:00 on Sunday, 08 July 2018, Israeli forces moved into Silwan village, south of occupied East Jerusalem. They raided and searched houses, from which they arrested 6 civilians, including 5 children. The arrested persons were identified as ‘Adnan Eyad al-Rajbi (16), Ahmed Eyad al-Rajbi (13), Ahmed Nidal al-Rajbi (13), Ahmed Jameel al-Silwadi (15), Ahmed Yunis Abu isninah (16), and Mahdi Jaber (19). The Israeli forces claimed that the arrested persons threw stones at houses, which were seized by Israeli settlers. At approximately 16:00 on Tuesday, 10 July 2018, Israeli forces moved into Baten al-Hawa neighborhood in Silwan village, south of occupied East Jerusalem’s Old City. They raided and searched houses, from which they arrested 2 civilians, including a child, and then took then to an investigation center. The arrested persons were identified as Harbi Nidal al-Rajbi (15) and ‘Amr ‘Awad al-Rajbi (37). On Thursday, 05 July 2018, Israeli Municipality bulldozer accompanied with military vehicles demolished 4 glasshouse nurseries, a petrol station, and a carwash in Tablas area in Hizmah village, northeast of occupied East Jerusalem, under the pretext of non-licensing. One of the glasshouse nurseries owners, Malek al-Khatib, said that the Israeli forces moved into the area and then demolished 4 glasshouse nurseries belonging to Mohamed ‘Afeef, Hani ‘Askar and Samer Siwery. He added that the Israeli forces demolished a petrol station belonging to Ghaleb Salah al-Deen and a carwash belonging to Nader Salah al-Deen. He also said that that the Israeli forces damaged a large number of seedling ,confiscated tools used for cleaning cars, and leveled a 180-square-meter plot of land belonging to Nader Salah al-Deen. He pointed out that the Israeli forces deployed in the area while conducting demolition, attacked civilians present in the area, and prevented press staff from covering the demolition. In the framework of its projects, which aim at expelling the Palestinian Bedouin from their Communities deployed in the eastern borders of occupied Jerusalem and gathering them in one area in favor of implementing their settlement projects in the area, the Israeli authorities set up caravans in Palestinian civilians’ lands, east of Abu Dis village, east of occupied Jerusalem, in order to displace the Bedouin residents to these caravans. Hani Halabiyia, the Spokesperson of the Popular Resistance Committees in Abu Dis village, said to PCHR’s fieldworker that, on Sunday, 08 July 2018, the Israeli Civil Administration staff accompanied with Israeli trucks carrying caravans raided a plot of land belonging to Palestinian civilians, east of Abu Dis village, east of occupied East Jerusalem under the Israeli forces protection. The Israeli trucks then got the caravans down into the area. This coincided with the Israeli forces’ declaration that the area in a closed military zone and surrounded it with over dozens patrols in order to prevent Palestinian civilians from approaching. He said that 10 caravans were put on the same day while 13 other were put next day on Monday, 09 July 2018. Halabiyia expected that the displacing is not only for Khan al-Ahmer Community, but also for Abu Nawwar Bedouin Community. It should be noted that on 04 July 2018, the Israeli forces demolished 10 mobile houses and 9 barracks used for breeding livestock in Abu Nawwar Bedouin Community near al-‘Izzariyia village, east of the city. As a result, around 60 civilians became homeless. On 24 May 2018, the Israeli Supreme Court issued a decision that grants the Israeli authorities the right to demolish the houses of Khan al-Ahmar Bedouin Community and expelling them from their houses to what so-called “Jerusalem Gate” in al-‘Izzariyia village, east of occupied East Jerusalem. On 04 July 2018, the Israeli forces moved into Khan al-Ahmar Community, cut wires and removed the gate leading to it as a prelude to enter military vehicles that would demolish the community. After that, the Wall and Settlement Resistance Commission filed a petition to the Israeli Supreme Court by its lawyer. On 09 July 2018, the commission was able to issue a precautionary order that prevents the Israeli authorities from demolishing the community. The court gave the Israeli authorities until 16 July 2018 to response the petition. On Wednesday, 11 July 2018, the Israeli authorities imposed a partial curfew on Khan al-Ahmar Community residents and other human rights activists, in solidarity with residents of al-Khan al-Ahmar Bedouin Community, east of occupied Jerusalem, under the pretext that this area is a closed military zone. Dawoud Jahaleen said that the Israeli Civil Administration vehicles did not stop building roads from the last week in Khan al-Ahmar Community and its surrounding as a prelude to conduct the demolition. He added that the Israeli forces daily imposed a full curfew on the residents from 08:00 to 16:00. At approximately 11:00 on Wednesday, 11 July 2018, Israeli authorities confiscated a container from Shu’fat village, north of occupied East Jerusalem, under the pretext of non-licensing. Ameer al-Qemirey said that the Israeli Municipality staff along with the Israeli forces raided al-Qawasmi car showroom in Shu’fat neighborhood and confiscated a container, which includes desks for the car showroom‘s workers. During last June, the Israeli vehicles demolished 15 residential and commercial buildings in Jerusalem while the Israeli Municipality forced 3 civilians to self-demolish their facilities. At approximately 09:00 on Thursday, 05 July 2018, Israeli forces backed up with 2 military vehicles and accompanied with 3 vehicles of the Israeli Civil Administration and a mounted-crane truck moved into Um Nir area near Sosiyia village, south of Yatta, south of Hebron. The Israeli soldiers deployed in a plot of land belonging to al-Jabour Family and confiscated a tent belonging to Fareed Ahmed Za’al Jabour (37), under the pretext of non-licensing. It should be noted that Fareed established the tent 3 weeks ago in a plot of land and he was living in it with his wife and their 3 children. After confiscating the tent, he refused to leave and lives with his family under trees. It should be noted that the Israeli authorities established a park years ago near Kherbit Um Nir and conducted an archaeological excavation for some ancient Roman temples and surrounded them with stone walls, where many tours are organized for Israeli settlers. Following that, the Israeli forces headed to Kherbit al-Mofaqarah, east of Yatta, where the Israeli Civil Administration Staff dismantled pillars of a barrack built of tin plates and used for breeding livestock. The abovementioned barrack belongs to Qasem Mahmoud Hamamdah. It should be noted that the Israeli forces dismantled the tin plates 2 weeks ago and left the pillars in the area. At approximately 09:30 on Tuesday, 10 July 2018, Israeli forces accompanied with 2 military vehicles and a vehicle of the Israeli Civil Administration moved into Khelet al-Farra area, west of Yatta, south of Hebron. The Israeli Civil Administration officer handed Fawzi Hammad Taim Abu Tabeikh 3 notices to stop construction works in 3 houses and a livestock barn under the pretext of non-licensing. The Israeli Civil Administration officer gave Fawzi 20 days to change the legal status. At approximately 11:00 on Wednesday, 11 July 2018, Israeli forces accompanied with military vehicles, a vehicle of the Israeli Civil Administration, a bulldozer, and a mounted-crane truck moved into Khelet al-Dabie’ area, east of Yatta, south of Hebron. The Israeli forces deployed in the vicinity of a school, which was built a month ago for 13 students from the village’s residents. The school is comprised of 2 caravans brought from al-Hathaleen area. The Civil Administration officers dismantled the caravans’ walls before confiscating them while the bulldozer demolished the caravans’ floor built with concrete. On Thursday, 05 July 2018, Israeli settlers from “Neve Daniel” settlement established in Palestinian civilians’ lands, south of Bethlehem, uprooted with an electric saw 350 grape trees from a plot of land belonging to Islam ‘Ali Jaber Ghunaim. The land’s owner said that while he was heading to his plot of land in Thaghrit Hammad area in al-Khadir village, which is located near the abovementioned settlement, he was surprised with uprooting the grape trees planted 5 years ago. He also said that the Israeli authorities established before many months a Talmudic School, which includes dozens of students. Islam pointed out that he submitted a complaint to the Israeli authorities, which as usual respond slowly to the complaints and without achieving any results. Forty olive trees, which belong to ‘Esam Najeh Shareef al-Safadi and were planted 4 years ago, were damaged. Sixty-two olive trees, which belong to Mohamed Ahmed Khalil Shehadah and were planted 4 years ago, were burnt and damaged. 7 olive trees, 9 almond trees and 3 grapevines, which belong to Sameer Mohamed Mohamed Sawalmah and were planted 12 years ago, were burnt. 10 olive trees and 2 almond trees, which belong to Raied Mahmoud Ahmed Sabbah and were planted 4 years ago, were damaged. 10 olive trees and 4 almond trees, which belong to Najeh Abdullah Dieb Shehadah, were damaged. 12 olive trees, 6 almond trees and a pomegranate tree, which belong to Shaher Abed al-Hafiz Khalil Shehadah, were burnt. On Saturday, 07 July 2018, a group of Israeli settler from “Neve Daniel” settlement established in Palestinian civilians’ lands, south of Bethlehem, uprooted with an electric saw 250 grape trees from a plot of land belonging to Hasan Isma’il ‘Isaa. Hasan said that on Saturday afternoon, he went to his plot of land in ‘Ain al-‘Asafeer area in al-Khadir village and was surprised that Israeli settlers cut around 250 grape trees from his land. He said that he was waiting for several days to harvest the grape trees, which crops was estimated at 7 tons. As a result, Hasan’s family was deprived of the trees’ financial returns.